There’s an exhibition at the University of Delaware that I wish I could get to. It’s of documents about the First World War from the collection of Mark Samuels Lasner. The exhibition’s website gives you several specimens, including a letter from Rosenberg and sketches for Gassed by Sargent. 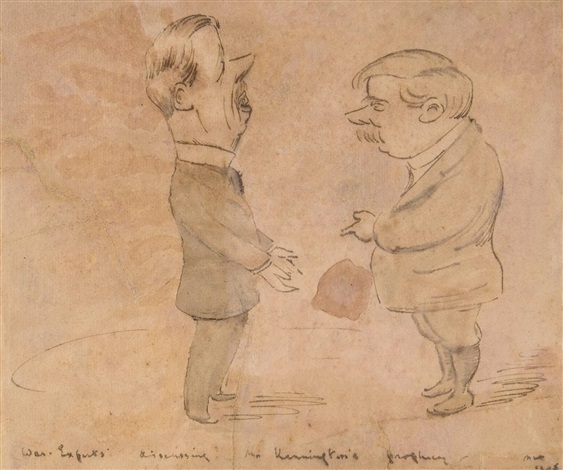 Mr Lasner is an expert on Max Beerbohm (he edited the definitive bibliography of the works of Enoch Soames), so there is plenty of Beerbohm in the exhibition. An example is the cartoon above: War-experts Discussing Mr. Kennington’s Prophecy. The experts, of course, are Arnold Bennett and H.G. Wells. But who was Mr Kennington, and what was his prophecy? And why did Beerbohm think it funny? the joke about “Mr. Kennington” remains obscure. The reference is probably to the painter and sculptor Eric Kennington (1888–1960), best known today for his illustrations to T. E. Lawrence’s Seven Pillars of Wisdom. Kennington fought on the Western Front and painted the men of his own unit in a work on glass titled The Kensingtons at Laventie, Winter 1914, which became one of the best-known images of the war. He was later appointed an official war artist. That’s a good guess, and I don’t know of any other contemporary Kenningtons (except for Eric’s father, who died that year). But did either of these Kenningtons prophesy? And why would their words be of absorbing interest to Bennett and Wells? Is Wells holding a document of some sort? I’d like to know. This entry was written by George Simmers and posted on November 1, 2015 at 6:57 pm and filed under War Artists with tags Arnold Bennett, H.G. Wells, Kennington, Max Beerbohm. Bookmark the permalink. Follow any comments here with the RSS feed for this post. Post a comment or leave a trackback: Trackback URL. Other sites give 1915 as the drawing’s date. You can half-see it at the bottom-right. If it’s actually 1916 (it looks like the date has been cut off) it could refer to Kennington’s fame after The Kensingtons at Laventie, Winter 1914 was exhibited. Could Wells be holding one of Kennington’s drawings or an exhibition catalogue? It could be a refernece to a work’s title – like Nash’s We Are Building a New World.